Adobong Labong, Bamboo Shoot Adobo. I want to share my version of adobong labong with pork, the recipe is fairly easy and it is basically the same with my other meat adobo. No sautéing no frying just simple old fashion adobo cooking method, the bamboo shoot and pork are braised with vinegar and soy sauce till most of the liquid has evaporated. I have to add some cornstarch during the final minutes of cooking to glaze and help coat the bamboo strips with the sauce. For this recipe I just used the canned bamboo strips that is usually available on the Asian section of most supermarkets. I have to re-boil it though and discard the initial water used to rid off the usual canned bamboo taste. I have to warn you not to tempted to add more vinegar, to avoid getting the bamboo shoots overly sour, bamboo shoots will tend to absorbed flavors from the rest of the ingredients. Here is the recipe on my version of Adobong Labong, Bamboo Shoot Adobo. In a sauce pan place the bamboo shoot and add enough water to cover. Bring to a boil and simmer for 5 to 10 minutes. Remove from pan drain and rinse. 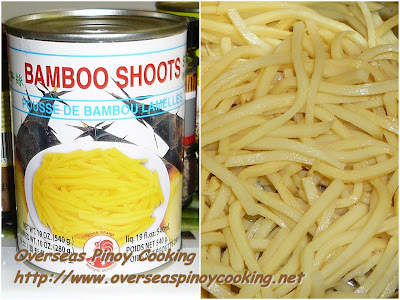 Return the bamboo shoots to the pan, add in 3 to 3 1/2 cups of water, add in all the other ingredients except the cornstarch and salt. Bring to a boil and simmer for 30 to 45 minutes or until most of the liquid has evaporated. Correct saltiness if required. Add in the cornstarch diluted in 1/4 cup of water and stir cook for another minute. Serve with a lot of rice. I'am Winnie T. Llorca Jr. e-mail @ llorca.alex@yahoo.com or jhunellorca_30@yahoo.com please send me your other unique recipe...thanks much! Hi! I have been searching for this recipe and I came across your site. I am a newbie in cooking and I want to cook this recipe for my hubby and in-laws. I tried this 2 nights ago for dinner and we all loved it. Thanks for sharing. God bless.